Deputy Chief Minister Datuk Amar Awang Tengah Ali Hasan presents a souvenir to Bapak Muhamad Ridwan, a representative of the Governor of Kalimantan, witnessed by (from left) CEO of Sarawak Energy Berhad, Sarbini Suhaili, Permanent Secretary to the Minister of Industrial and Entrepreneur Development Datu Liaw Soon Eng, Indonesian Consul in Kuching, Bapak Jahar Gultom, President of Sarawak Business Federation, Datuk Abang Haji Abdul Karim Tun Openg, Pak Santyoso Tio Prediden Kadim, Assistant Minister of Industries and Investments, Malcolm Mussen Anak Lamoh and Malaysian Consul in Pontianak, Mohiuddin Ghazali. KUCHING: Deputy Chief Minister Datuk Amar Awang Tengah Ali Hasan who is also Minister of Industrial and Entrepreneur Development and Second Minister of Urban Development and Natural Resources led a 160-member delegation on a business mission to Pontianak, West Kalimantan from 20 to 23 April, 2018 to further enhance business ties fwith West Kalimantan for the benefit of both countries. The visit was filled with expo and workshop sessions. 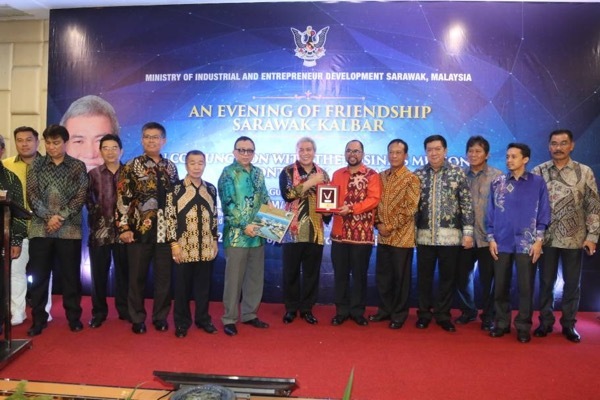 On Sunday evening the Sarawak state government hosted a dinner for all delegates and their West Kalimantan counterparts. Awang Tengah in his speech at the dinner said the business mission to Pontianak was to further enhance co-operation between Sarawak and West Kalimantan in terms of trade, business and economic development. He also pointed out that Sarawak and West Kalimantan are rich in natural resources. Awang Tengah also called for closer co-operation between both countries and to explore ways to add value to products from both countries. Haji Majais, Assistant Minster of Industries and Investments, Malcolm Mussen Anak Lamoh, Malaysian Consulate in Pontianak, Mohiuddin Ghazali, Permanent Secretary to the Minister of Industrial and Entrepreneur Development Datu Liaw Soon Eng and President of Sarawak Business Federation, Datuk Abang Haji Abdul Karim Tun Openg. Business mission to enhance ties with West Kalimantan 0 out of 5 based on 0 ratings. 0 user reviews.